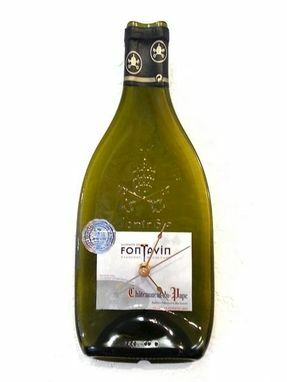 Champagne spells class, and so does this upcycled timepiece made from a 2009 bottle of Chateauneuf-Du-Pape. The translucent drab-green bottle nicely sets off the white label and the gold clock hands. Measuring 12'' x 5'', each of these timepieces is handmade.